The idea of computational thinking was popularized by Jeannette Wing in an article published ten years ago as a Viewpoint in the magazine of the leading society of computer scientists.1 She labels it an “attitude and skill set” that everyone can learn and use. The emphasis is on solving problems by exploiting the fundamental concepts of computer science: abstraction, decomposition, recursion, separation of concerns, and so on. In sum, Wing equates computational thinking with thinking like a computer scientist. Image from the book "Mindstorms"
The phrase “computational thinking” appears in Mindstorms (p.182) but without elaboration. We find detailed exposition of the idea in his 1996 paper “An exploration in the space of mathematics educations”3 (whose barely over 150 Google Scholar citations pale to Wing’s viewpoint piece!). Here, Papert explores several dimensions along which we can imagine that mathematics education can be reformed, at the same time as he examines the role of computers in this education. A few salient ideas in “An exploration … "
—The Power Principle: What comes first, ‘using’ or ‘understanding’? The natural mode of learning is to first use, leading slowly to understanding. New ideas are a source of power to do something. —Media defines Content: Old-school activities involve making inscriptions on paper, while in Papert’s alternative involve “manipulating a computer-based microworld.” New media open the door to new content. —Object before Operation: Giving mathematical ideas a “thing-like representation” helps thinking about them. Throughout, Papert is generous with examples from his experience with children learning with the Logo programming language. He describes students using a Logo object called RANDOM to create color effects on screen, and contrasts it to schools introducing probability using spinners or dice. (“What can children do with this new knowledge besides talk or deal with teacher-initiated problems?”) RANDOM is a mathematical object, and students naturally make new ones, say RANDOM-COLOR, taking in with ease the idea of function, and composition of functions. Let’s go back now to the contemporary message about computational thinking. Wing refined her meaning in 2010, always focusing on problem-solving and thinking like a computer scientist. She highlights abstraction as the most important process in computational thinking, and adds pattern matching and recursive thinking to the basic toolbox. Google developed their own set of free online resources for educators called “Exploring Computational Thinking” and the BBC offers an online tutorial called “Introduction to Computational Thinking” in their Bitesize section. Both list the key concepts: decomposition, abstraction, pattern recognition, algorithms. Google adds automation, data manipulation and analysis, and simulation. The International Society for Technology in Education (ISTE) and the Computer Science Teachers Association (CSTA) published a set of resources called the "Computational Thinking Toolkit” with videos, slide decks and booklets, and an almost identical message to the previously mentioned. 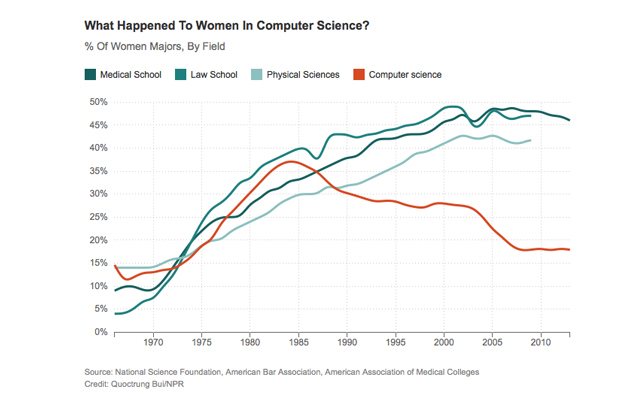 Percentage of degrees awarded to females, by field. Another influential figure in this conversation is the computer science professor Mark Guzdial. 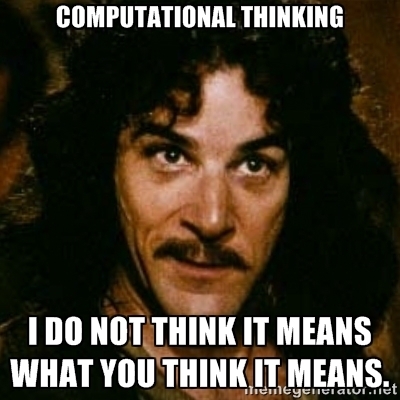 His article “Education: Paving the Way for Computational Thinking,”4 emphasizes the theory of computation, not using computing to think about the world. With the phrase “understand computing” appearing a dozen times, it seems this article equates computational thinking with thinking about computing—which again is disempowering the idea. What’s interesting is that, in practice, Guzdial has worked tenaciously to introduce computing in a project-based, contextualized fashion with his Media Computation approach. In his TEDx talk on MediaComp, Guzdial does not use the word “abstraction” once; instead, his students “can use programs to understand their world, to manipulate their world." Grady Booch, IBM Fellow and Chief Scientist of Watson/M, poked the idea of computational thinking in the right direction in his ACM Learning Webinar (Feb. 3). He noted that humans have outsourced part of our brain to our devices, changing the way we go about the world. There is incredible expressiveness in our algorithms, Booch says. His words hint at computing as a representation: “the technology of literacies”5. But he is still attached to Wing’s language, reducing the idea back to the components of abstraction, data, and algorithms. 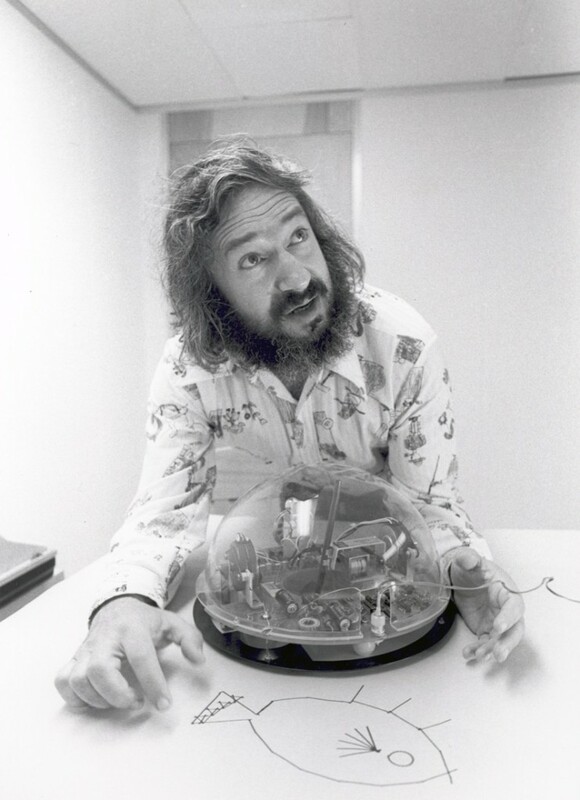 3 Seymour Papert (1996), An Exploration in the Space of Mathematics Educations, International Journal of Computers for Mathematical Learning, Vol. 1, No. 1, pp. 95-123. 5 Andrea diSessa (2008), Can students re-invent fundamental scientific principles? Evaluating the promise of new-media literacies, in T. Willoughby and E. Wood (ends. ), Children’s learning in a digital world (pp. 218–248); Blackwell Publishing, Oxford, UK.